A few months ago I discovered that if I took a shower at the gym after my workout I saved myself a lot of time and stress at home. Showering at home left me with several choices: 1) shower right away and let Mazen’s shirt get wet while he stands next to the shower 2) put him in his crib with toys, which often ends in crying 3) sit around sweaty until naptime and lose the first 20 minutes of work time 4) not shower. Thus, the gym shower ritual was born. After a few months of showering at the gym nearly every day, I have a few tips that have helped me expedite and and simplify the process. = leave jewelry, nice shoes and accessories at home. (This is assuming you are going straight home and not to work or a meeting.) I used to pack up my jewelry and nice shoes and it added a few extra steps every time I packed my bag. Now I wear my sneakers back home (no matter how dorky they look with skinny jeans!) and don’t worry about earrings. Ever showered at the gym only to realize you left your bra at home? It happened to my girlfriend just last week! I combat that by counting my clothes – 1, 2, 3, 4, 5 = unders, bra, socks, jeans, shirt. I always have 5 pieces – no less – and I count them out while packing. Occasionally I’ll have a 6th item like a sweater or scarf, but never less than 5. Minus the naked part (because that’s just not me) I ran the gamut of towel options before I finally signed up for towel service. Having free towels has been awesome, especially because it covers our whole family when we take Mazen swimming. It’s not cheap, but it’s a completely reasonable expense for how much I’m showering at the gym and has really simplified the process. I thought about also purchasing a locker rental, but at $22 a month I felt it was a bit too expensive, especially since I still had to haul my clothes back and forth. I have a plastic case that houses my shower toiletries (it’s from Target). It’s totally waterproof so it goes with me to and from the shower stall. Everything else I need is in a separate make-up/get dressed bag. 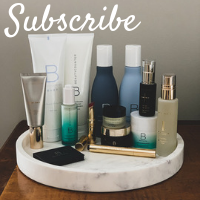 I’m using up lots of Birchbox and hotel samples in the shower. Once I realized I was going to get wet and shower, I thought about how easy it would be to put on my bathing suit and get in the pool first – or hot tub!! Now if my friends and I have a few extra minutes we add that step to the showering process. The hot tub feels like such a luxury! I’ve also tested out my gym’s one and only steam shower and on a cold day it’s divine! My goal was to have as little to pack and unpack every day as possible, so I bought a double set of all of my make-up. It was a bit of an expense up front, but I’ll use it all eventually even if I quit showering at the gym. The only thing I have to pack and unpack everyday are my clothes. What are your locker room tips!? Great tips! I love the tip about counting the clothes. I have more than once forgotten to pack undergarments! Next time I shower at the gym I will have to do this! I just recently bought a 2nd set of makeup. I usually splurge on department store makeup, so for my second set I went with cheaper drugstore brands. It’s is so helpful to only have to pack clothes for the gym! As for towel service…I carry my own towel with me and just hang it to dry at my house, and reuse. I guess some people might think that’s gross but I’m fine with it. Such a thorough and detailed post about the process! Though I don’t have a need to shower at the gym right now, I know eventually when a full time job is in the picture that it will definitely be an option to consider! I will definitely be referring back to this post for tips! Thanks! I actually did a post last week about what clothes to pack for swimming. I have a wet bag I bring into the shower area. It has my shampoo/shower stuff, and houses anything that is wet during the drive home. I also have a dry bag that holds my clothes. I’ve been a quiet reader for years, love your blog! Had to comment on this post though…this is SO HELPFUL! I’ve been getting back into AM workouts, and know that I should be showering at the gym vs driving home from the gym to get ready. Great ideas for streamlining the gym-showering process. Thanks!! I carry a towel from home to cover up in… and then dry off with the gym towel. I am too cheap to pay for towel service. It always blows my mind how much time I save by showering at the gym. I think it’s mostly because I’m less likely to stand under the stream of hot water like I would at home. Having extras of some things (mostly stuff to do my hair + deodorant is key for me). I keep my make up at home in a bag anyway so all I have to do is zip it up and put it in my gym bag, though having an extra one is also a good idea. One key for me is keeping a pair of flip flops in my bag at all times. I don’t like walking around the gym locker room without flip flops and will leave if I forget them and come back to shower at home, so that’s key. These are great tips! I started working out in my lunch break and have been fumbling with getting a routine. First day forgot deodorants, shower shoes, etc. Its wonderful though because I can leave work and pick up my son and not have to worry about getting my workout in. This definitely sounds like it would cut out some time! Not something I’d do at my gym though… The facilities are old and kind of gross, but that’s what you get for $19.99 a month! Wow, towel service included? That’s awesome! Here in Germany most of the people shower at the gym. I commute by train, and even if I do after work workout (my gym is next to the lab), I don’t think it would be fair to my co-travelers not to take a shower. Mostly I squeeze in a workout between two meetings, so I often bring whole lot of clothes and makeup. I would let my towels dry at home, but the problem is that I often don’t end up going straight home, and after 5 hours of being wet, those towels do not look appealing. Thanks for this post! I’ve been showering away from home once a week and inevitably always leave one piece of clothing at home! Plus, always have to pack the bag the night before and move my toiletries around. Where did you get your black and white polka dotted bag? That looks like a great solution for makeup, etc. I don’t think you mentioned it (if so, oops) but shower shoes! I love these tips! Especially the 5 item rule- that would have helped me so much! I used to shower at the gym and go straight to work… one time I forgot a real bra and had to wear a sportsbra to work. It wasn’t toooo terrible though! Great tips! I recently started showering at the gym before work and sometimes the thought of just packing my gym bag is more exhausting than actually working out. 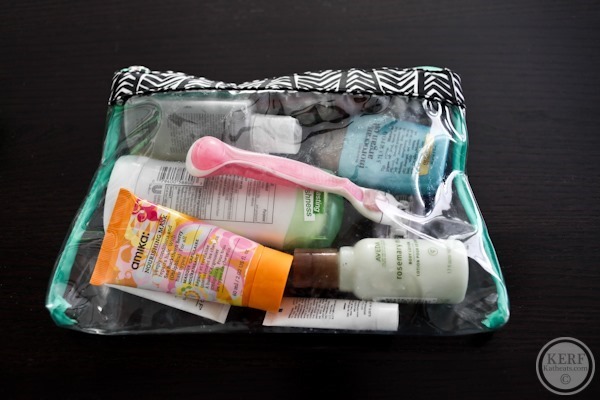 I’m going to look for a plastic case for my toiletries… currently I’m using a zip lock bag! Haha. 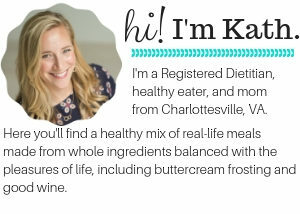 Hey Kath! Just wanted to let you know for some reason your new posts aren’t showing up when I go to your site directly, but they are showing up in my feedly reader. I think things are still pretty wonky in IE and in Firefox. I got the email notification of a response to my comment but as I keep returning to the page in IE via the link in the email, or from your homepage, the comment response isn’t showing and mine still shows awaiting moderation. And in Firefox it gives me Page Not Found! I think your hosting providers have some work to do :-/ This is madness! I think I have caught up on posts at last but it took a lot of hunting around. It seems to be a caching issue. We’ll keep tweaking it. So things are still off in IE? Just wanted to add that as of today on my tablet in Chrome the newest post I’m seeingbus training with erin pt2. It’s dated feb 14, so I’m bthinking maybe you’ve put something else up but I can’t see it. Great post! I don’t always shower at the gym, but I do like to shower after I swim laps. I always keep a spare towel and set of flip flops in my car for the days that I forget them (remembering everything you need at 5:30 am can be very difficult!) I really like your idea of counting clothes. More than once I have forgotten underwear or a bra. Such a pain! This is a great post! I always take a shower at the gym – so much easier. I’m sure this is a given, but I keep a pair of $1 Old Navy flip flops for the shower, too. Great tips! $15/month doesn’t seem so bad–you’d probably spent close to that at a laundromat, and that wouldn’t account for your time and effort. I always used to shower at the gym when my kids were Mazen’s age. Such a stress reliever!! Having a second supply of makeup is a must and worth the expense! I’m lucky because my gym (Lifetime Fitness) has free towels and lockers. I don’t take this luxury for granted!! You never cease to amaze me with your neat organizing skills! I can only imagine how stressful it would be to even DARE take your eyes off an almost-toddler!! I admit, I’m jealous. I work full time outside the home and by the time I pick my son up from daycare, we have about 30 minutes until it’s time to start his dinner and bedtime routine. Going to the gym in the morning is not an option. It sounds heavenly to be able to work out, swim, hot tub, steam shower, and take as long as I please to get ready, every day. Why is the morning not an option? I have two kids and a FT job and it’s the only time I can make it. Though admittedly, most of the time I choose sleep over the gym. When I only had one I was better. I am making do with 30 min walls at lunch and some weights at home. I hit the pool and hot tub on Sunday. Well sometimes. sounds like a great system!! Absolutely brilliant post!!! Gave me a bit of a giggle reading it but all so true!!! This is a great post, Kath. Taking time to shower and beautify afterwards is one of those things you don’t fully appreciate until you have little babies/children! It is always stressful trying to do it at home with kids. At least now my 2 year old will sort of distract/entertain my 4 month old, haha. I can usually get a coat of mascara on. I say $15 is definitely worth it for the towel service (though a moot point now), and the 2nd set of makeup is frankly brilliant. I used to do that when I worked evenings. I called it “the process” because I’d get ready for work at the gym. Unpacking and repacking the next day was always such a chore though. Ugh. I don’t miss those days! I love the double make-up idea, but I’m not sure I can convince my husband it’s necessary. That would save so much time, though. Also, my gym (the YMCA) doesn’t have any sort of towel service. I so wish it did–that sounds like a great perk! Awesome tips! I espescailly love the counting items part – I once forgot my underpants. It was a jeans day. At uni. Fail. I wish my gym had a towel service – I have to take 2 towels (one for the gym & one for the shower). I actually had to start using a bigger gym bag! Having a shower at the gym makes so much more sense when you have a kid – it prevents accidentally stayin in gross sweaty clothes for hours on end. Can you get a pack-n-play for Mazen? Maybe it’d be a new fun thing for him, since he probably associates the crib with sleeping only and maybe that’s why he fusses. I am thankful for included towel service! I used to go to a gym that did not have it, and it was one more item to haul. Love the idea about counting clothes. I’ve ended up having to go home when I have forgotten underwear before. I was not going to wear the sweaty ones that I had worn during my workout. Now, just to be sure, I just keep an extra pair in my bag at all times. My shower shoes always stay in my bag as well. Another benefit to having a second set of all items: Having a second set of everything ready to go means that toiletries are already packed for a trip. Great idea to buy double makeup. I did that with a hairbrush and some other things but not my full makeup set! Also, I’m a big fan of shower flip flops!! Great post! Do you know if the Live Well 360 bags ever go on sale? GREAT tips Kath – I honestly never thought of showering at the gym since I live next-door. But you’re right – this would solve SO many toddler/showering issues at home! I have been looking for a new gym bag.. I’m going to have to take a look at that one! I also try not to pack and unpack my gym bag and most often just keep it in my car. I don’t shower at the gym but keeping it packed gives me peace of mind that I know I’m not going to show up at the gym with an iPod but no headphones or one sock. I’ve felt a lot less stress since I’ve started doing that. And I’m lucky my gym provides towels too because that would be an extra step to remember! Because I swim before work, it’s critical that I not forget anything ( phone, lunch, work keys) so I put a Post it note by my front door with a list of everything I need to bring. It’s kind of dorky, but I’ve yet to forget my undies. The counting clothes idea is genius…sheer genius! Socks, bras and undies were always the forgotten items for me. Also, totally agree about having doubles of things. So worth it in the long run! Plus, if you ever run out of your ‘at home’ stash, you’ve got your gym ones as back up! I wish my gym did a towel service – the large bag of stuff always puts me off. Plus I only live at the bottom of the car park, but somehow you always find things to do when you are rushing home to shower. The number of times I have forgotten undies! Kath, I also started showering at the gym once my (now 6yr old) was about Mazen’s age as it made things just that much easier for us once we got home. 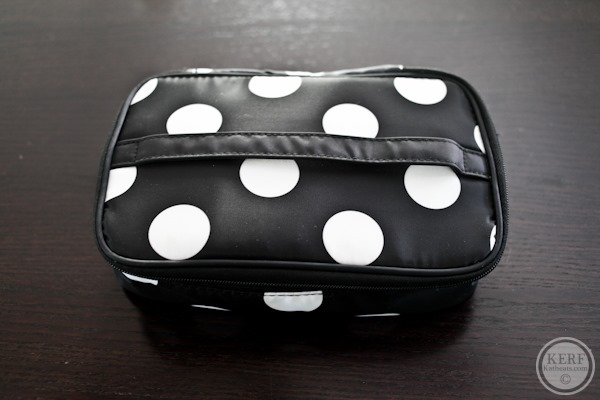 Doubling your toiletries/supplies of things like brushes, hair product, facial lotion, etc. in addition to that annoying part of leaving a key item at home (hello bra and underwear?? i’m talking about you)-once you do it enough, you’ll get into a rhythm. Now, given my daughter’s age, I dont have to worry about it as much anymore and only plan to shower when i know I’ll have a particularly sweaty session in store. Consequently, because I’m not in the habit like before, I find that I forget more of those key items noted above. DOH! You just gave me an ah ha moment. I have the same problems with my child now… I don’t have a great place to put him while I shower and my showers are always sub par due to a) him either getting into something, or b) him crying. I am going to start this ritual today! Great tips! After forgetting essentials one too many times, I finally started keeping spare socks, undies & a belt in my gym bag which has saved my morning a bunch of times! I finally gave in and doubled my makeup stash as well. totally worth it. This is such a wonderful refreshing post to read! Thank you so much for the great tips 🙂 I really enjoy reading your process/procedure posts! Mine is about $150 for 3 people including childcare. I think it’s priceless! I joined Equinox in the city (ny) since it was by my job. They have tons of lunchtime classes.The best part about the gym is that it is fully stocked, included in your membership fee. This includes hand towels, cold towels, full sized towels, showers that are stocked with kiehls products (shampoo, conditioner, body wash), spray deodorant, disposable razors, mouth wash, hair gel, hair spray, blow dryers etc. It’s so convenient because you don’t have to bring anything but your clothes and some makeup. Awesome! I wish ours had better products. I can’t imagine trying to shower and dress at my gym (YMCA). Maybe two outlets, six sinks, four showers, etc. Definitely not set up for showering and dressing for the day. And it’s relatively new. Shower before getting in the pool, though. Better for everyone. The counting tip is a great one! I save time at the gym by setting by phone alarm for 5 mins – first 5 for showering, second for lotion/deodorant/dressing, third for makeup, and 4th for drying my hair. It helps to keep me from drawing out any single “getting ready task” and I don’t have the distractions I’d have at home as an excuse to take more time. Also, I pack my gym bag the night before, which seems to take half the time it takes me in the morning. Wow, I’m surprised you use the towel service, not because of the cost, but because of the impact on the environment. If you’re going straight home afterwards, it doesn’t seem too gross to just hang it to dry and reuse it throughout the week. The gym has to wash all those towels every day and probably uses harsh chemicals on them. When I’m at hotels, I always reuse my towels like they suggest on those little cards because it really does save a lot of water when you do the math. I’m all for convenience and all, but I try to make sure I’m not too wasteful if I can help it. Using dirty towels is not a health concern? I don’t think using a towel several times after showering is too much of a health concern. Forgive me if you said this in a previous post and I missed it, but where is Mazen when you are working out these days? Does he (ever?) go to your gym’s child watch? My son is a couple months older than M and I too am a SAHM so he is very accustomed to being with the family 24/7… the one and only time we tried child watch (about a month ago) he lasted 10 minutes. From his perspective I’m sure he feels like I’m abandoning him, so I’m not pushing it, but I am looking forward to the time when he might willingly spend an hour or so in child watch a couple days a week… the child care workers at the Y have encouraged me to come back and keep trying and that’s the plan, but I’m wondering what your experience has been with your little guy who’s about the same age. Mason started going when he was young so it has been a smooth transition. But I have friends who waited until their kids were older and they also cried a lot during their first few times. But they are all happy there now so I think it is just an adjustment period.. I literally let out a huge gasp when I read ACAC is adding towel service!! I read a good blog post by Shay Shull. She has good ideas for packing a gym bag also. I like your organization for gym days. 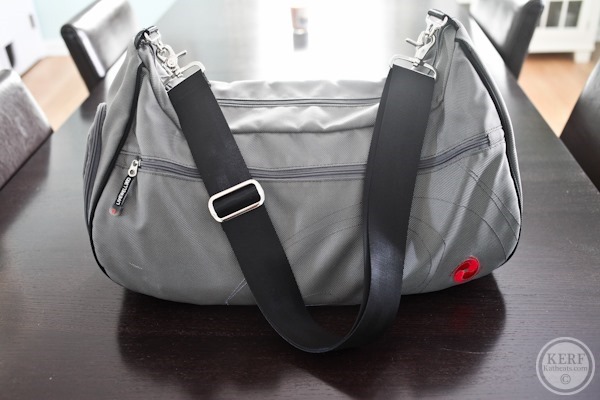 Mine are similar with a few differences: I use a wide mouth gym bag so that it’s all there at a glance. I also stow a pair of flip flops in my bag for when using the shower. 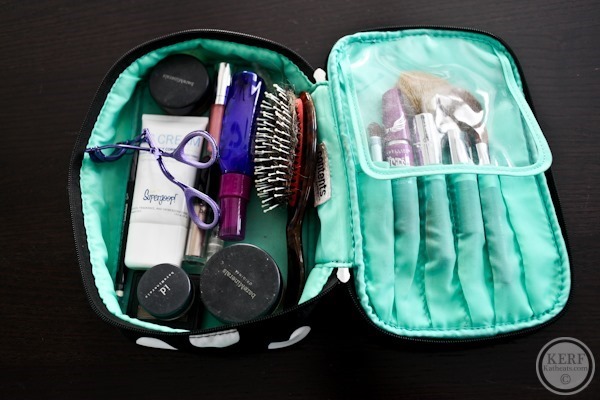 I place my toiletries in a gallon-size ziplock bag but like your make up case and will look for one soon. I love your idea of 2 make up bags and am currently working on procuring a second one:-) maybe a second hairbrush, too. The other habit I have is to line up my gym clothes the night before, place them on the radiator so that when I wake up, it’s automatic pilot and I’m more inclined to get into my warm and toasty gym clothes. I just had to laugh when you said walk around naked because a few weeks ago I was at the gym and went into the ladies room and there was a girl/woman (around 30)? standing in front of the sinks naked blow drying her hair. I’m not a prude by any means but I didn’t expect it and didn’t know where to look. I was way more uncomfortable than she was. She stood there taking her time, drying her hair, not the least bit worried about anything. Am I weird that I thought it was awkward? Anyway, I’m curious – do you leave your makeup at the gym in a locker or do you take it with you every day? Do you not have to blow dry your hair? When I used to get ready at the gym before work it was such a pain because I had to blow dry and curl my hair. It was just too much stuff to bring in and out of the gym. Haha. Yeah some people really don’t care! I could never do that, but more power to them. You forgot shower flip flops!!! I would rather walk home naked than shower with out flip flops at the gym…..! They live in my bag!